Goldman Sachs’ net income declined 42% from 2009 to 2016. How many of you reading this were aware of that fact? Yet GS’ stock price closed today 36% above its 2009 year-end closing price. See below for details. Auto sales in April declined again, with the Big Three domestic OEMs (GM, F and Chrysler) missing Wall St estimates by a country mile. The manipulated SAAR (seasonally adjusted annualize rate) metric put a thin layer of lipstick on the pig by showing a small gain in sales from March to April. But this is statistical sleight of hand. The year over year actuals for April don’t lie: GM -5.7%, F -7% and Chrysler -7.1%. What is unknown is to what extent the numbers reported as “sales” were nothing more than cars being shipped from OEM factory floors to dealer inventory, where it will sit waiting for an end-user to take down a big subprime loan in order to use the car until it gets repossessed. The growth in loan origination to the key areas of the economy – real estate, general commercial business and the consumer – is plunging. This is due to lack of demand for new loans, not banks tightening credit. If anything, credit is getting “looser,” especially for mortgages. Since the Fed’s quantitative easing and near-zero interest rate policy took hold of yields, bank interest income – the spread on loans earned by banks (net interest margin) – has been historically low. Loan origination fees have been one of the primary drivers of bank cash flow and income generation. 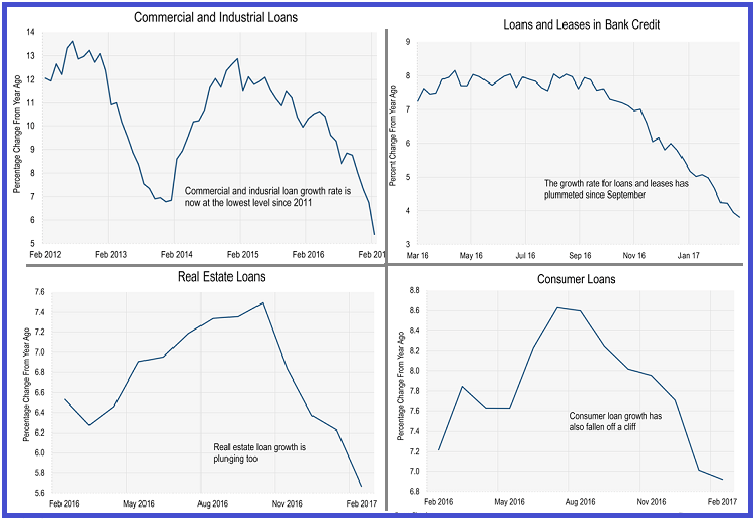 Those four graphs above show that the loan origination “punch bowl” is becoming empty. HOWEVER, the Fed’s tiny interest rate hikes are not the culprit. Loan origination growth is dropping like rock off a cliff because consumers largely are “tapped out” of their capacity to assume more debt and, with corporate debt at all-time highs, business demand for loans is falling off quickly. The latter issue is being driven by a lack of new business expansion opportunities caused by a fall-off in consumer spending. If loan origination continues to fall off like this, and it likely will, bank earnings will plunge. But it gets worse. As the economy falls further into a recession, banks will get hit with a double-whammy. Their interest and lending fee income will decline and, as businesses and consumers increasingly default on their loans, they will be forced to write-down the loans they hold on their balance sheet. 2008 all over again. Because of this, I think Goldman Sachs (GS) makes a great short idea, although I don’t want to suggest timing strategies. It’s an idea that, in my view, you need to short a little at a time and add to it if the stock moves against you. I could also be a good “crash put” idea. Goldman will be hit by a fall-off in loan demand and by a big drop in the fees from securitizing the loans it underwrites into asset-backed securities (ABS). In addition, GS facea an even bigger drop in the fees from structuring and selling OTC “hedge” derivatives to the buyers of Goldman-underwritten loans and ABS. Goldman’s net interest income has declined over the last three years from $4.1 billion in 2014 to $2.6 billion in 2016. This is a 36.5% drop. To give you an idea of the degree to which bank net interest income has dropped since the “great financial crisis,” in its Fiscal Year 2009, Goldman’s net interest income was $7.4 billion. That’s a 64% drop over the time period. In FY 2009, Goldman’s net income was $12.2 billion. In 2016, GS’ net income was $7.1 billion, as 42% decline. To give you an idea of how overvalued GS stock is right now, consider this: At the end of GS’ FY 2007, 6 months before the “great financial crisis” (i.e. the de facto banking system collapse), Goldman’s p/e ratio was 9.5x. At the end of its FY 2009, its p/e ratio was 6.9x. It’s current p/e ratio 13.5x. And the factors driving Goldman’s business model, other than Federal Reserve and Government support, are declining precipitously. As for derivatives…On its 2016 10-K, Goldman is showing a “notional” amount of $41 trillion in derivatives in the footnotes to its financials. This represents the sum of the gross long and short derivative contracts for which Goldman has underwritten. Out of this amount, after netting longs, shorts and alleged hedges, Goldman includes the $53 billion in “net” derivatives exposure as part of its “financial instruments” on the asset side of its balance sheet. Goldman’s book value is $86 billion. If Goldman and its accountants are wrong by just 1% on Goldman’s “net” derivatives exposure, Goldman’s net derivatives exposure would increase to $94 billion – enough to wipe out Goldman’s book value in a downside market accident (like 2008). If Goldman and its “quants” have mis-judged the risk exposure Goldman faces on the $41 trillion in gross notional amount of derivatives to which Goldman is involved by a factor of 10%, which is still below the degree to which GS underestimated its derivatives exposure in 2008, it’s lights out for Goldman and its shareholders. Think about that for a moment. We saw how wrong hedge accounting was in 2008 when Goldman’s derivative exposure to just AIG was enough to wipe Goldman off the Wall Street map had the Government not bailed out the banks. I would bet any amount of money that Goldman’s internal risk managers and its accountants are off by significantly more than 1%. That 1% doesn’t even account for the “fudge” factor of each individual trading desk hiding positions or misrepresenting the value of hedges – BOTH crimes of which I witnessed personally when I was a bond trader in the 1990’s. As you can see in the 1-yr daily graph above, GS stock hit an all-time high on March 1st and has dropped 12.5% since then. I marked what appears to be a possible “double top” formation. The graph just looks bearish and it appears Goldman’s stock is headed for its 200 dma (red line,$202 as of Friday). To save space, I didn’t show the RSI or MACD, both of which indicate that GS stock is technically oversold. The analysis above is from the April 16th issue of IRD’s Short Seller’s Journal. I discussed shorting strategies using the stock plus I suggested a “crash put” play. To find out more about the Short Seller’s Journal, use this link: SSJ Subscription information. There’s no minimum subscription period commitment. Try it for a month and if you don’t think it’s worth it, you can cancel. Subscribers to the SSJ can subscribe to the Mining Stock Journal at half-price. On Friday we found out that the University of Michigan Consumer Sentiment poll dropped to 6-month lows during May. As Bloomberg News describes: there is month-to-month weakness which doesn’t point to strength for consumer spending in May. The current conditions component ends May at 100.8 vs April’s 107.0 in weakness that also hints at trouble for May’s jobs market. A decline in the expectations component, to 84.2 from 88.8 in April, points to less confidence in the longer-term jobs outlook. What’s interesting about this sentiment reading is that, historically, there is a strong correlation between consumer sentiment/confidence readings and a rising stock market. The S&P 500 hit a new all-time last week and yet consumer sentiment is tanking. In addition, the Chicago PMI (Purchasing Managers Index) crashed to a 6-year low. The overall level is back to where it was when Lehman collapsed. New orders, production and employment all contracted in May. The index has dropped 5 out of the last 7 months, plunging in 3 of the months. The index measures manufacturing and non-manufacturing activity in the Chicago region, which is considered a manufacturing “bellweather” regaion. The overall index dropped to 46 from April’s 52.3 reading. 53.1 was expected. A reading below 50 means that manufacturing activity was contracting in May. I wrote an article for Seeking Alpha in which I presented data which supports the thesis that U.S. economy is in real trouble. This is despite the reputedly “strong” housing market market, which is primarily of a product of Fed-fueled housing price inflation and individual “investor”/flipper activity. The flippers are about to get stuck holding a big “bag” of extremely overpriced homes. I believe the data I presented above indicates the likelihood that the U.S. economy is currently in a recession. If not a recession, then it’s headed into one. I believe this economic downturn has a high probability of being worse and last longer than the 2009 recession. The economy is tanking just like I’ve been suggesting in several previous posts. The change in real private inventories added .74% to Q1 GDP. This means that manufactures piled up inventory. BUT, real final sales of domestic product dropped .5% in Q1 (vs. a 2.3% gain, supposedly in Q4 2014). This means that the .2% GDP number was boosted .74% by manufacturers producing inventory that didn’t sell. If manufacturers produced goods at the rate those goods were selling, GDP would have been negative. That graph shows a big part of the reason for “downside escape velocity.” If big manufactures had been applying “just in time” inventory management, GDP would have been negative because real final sales were negative. That graph shows the direction of wages for 80% of the population that actually have jobs. 80% of all workers have less money to spend, especially after netting out non-discretionary spending plus the increased cost of Obamacare. That graph shows real “downside escape velocity” in wages. Real nonresidential fixed investment dropped 3.4%. What happened to this boom in commercial real estate? I know for a fact that the commercial real estate vacancy rate in Denver is soaring. I’m hearing the same thing from readers all over the country. QE has done nothing except keep the big banks from collapsing and has created hundreds of billions of dollars of malinvestment, leading to massive overcapacity of commercial buildings and production facilities. The reason propaganda, manipulated economic statistics and market intervention/rigging always ultimately fails is because eventually the truth about the underlying reality eventually emerges. This is why I believe that we are on the cusp of a massive systemic collapse. The first revision of Q1 GDP showed that GDP declined 1%. If you strip out inflation, the contraction would be even more severe. The original Government Q1 estimate showed a .1% increase, before inflation is stripped out. Forecasters were expecting the revision to show a .5% decline. It came in at -1%. You can read Forbes’ reporting of this here: Recession Time. Of course, in it’s infinite Einsteinian wisdom and superlative willingness to spin the facts, Bloomberg News is reporting that negative GDP number does not mean a recession. I guess they have their own “special” dictionary of economic definitions. Let me correct one mistake in the title of that graph. It says “real” GDP. But the number that’s being reported is “nominal” GDP, meaning it includes price inflation. If you strip out the price deflator used the Government of 1.3%, “real” GDP would -2.3%. Bloomberg is also blaming the bad number on “the weather.” Oh, the dog ate my homework. But we know that’s not true because the retail sales and housing numbers continue to decline month to month this year through April. Sorry Bloomberg/media, April had great weather for the most part. Was it too sunny out to go shopping or look for a home? The real economy is contracting even more quickly than the rigged Government numbers show. Retail sales are plunging, with both shopping mall and online sales registering declines. Real average weekly income is declining, inflation is heating up and more people leave the workforce everyday and take out student loans to enroll at OnlineUniversity.com.